Louisville, Kentucky — According to the National Association of Home Builders, fireplaces rank among the top three features desired by homeowners. More than 55 million American homes include the popular amenity. But for the 80 percent of homeowners who reported in a recent survey sponsored by the Propane Education & Research Council (PERC) that they were “concerned” about the energy efficiency of their homes, propane fireplaces provide benefits beyond adding comfort and aesthetic value. The survey, conducted by the Opinion Research Corporation, revealed that homeowners’ concerns for energy efficiency is as pragmatic as it is altruistic, with 70 percent of those concerned citing equal consideration for saving money and helping or protecting the environment. When commenting on fireplaces, homeowners ranked energy efficiency above price and dependability as most important when purchasing a fireplace. Today, gas-burning hearth products are the most popular in the category and almost 70 percent now burn gas, according to the Hearth, Patio & Barbecue Association (HPB). Unlike fireplaces that burn biomass such as wood or pellets, propane fireplaces emit no noxious fumes or black smoke. In addition to being environmentally friendly, propane fireplaces provide a consistent heat source, particularly in areas prone to power outages. For many parts of the country, spring and fall bring a mix of warm and cool temperatures, requiring a minimal level of home heating. 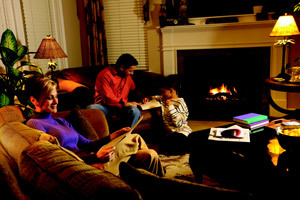 One energy-efficient alternative to central home heating during these “shoulder seasons” is using a fireplace to heat defined living zones of the home while the rooms are in use. Unlike wood-burning fireplaces, which allow most of the heat to escape through the damper that must be open during use, direct-vent gas inserts are designed to reduce escaping heat and provide more consistent warmth. In addition, unlike wood-burning fireplaces, propane fireplaces protect air quality in the home and do not increase levels of airborne allergens. Innovations in gas fireplaces and hearth products allow flexibility for homes of all sizes and needs. Propane fireplaces are designed with an on-off switch and the ability to control flame size. Because direct-vent systems do not require a chimney through the roof and can vent through a wall, they work well in small living spaces, including apartments and condominiums. “Homeowners who want to help save energy and protect the environment are choosing propane, a highly energy-efficient, clean fuel that’s available right now,” said Paul Pearce, Operator of Pearce Bottled Gas in Greeneville, Indiana. “It fits what homeowners are looking for and is available everywhere — not just on a grid.” Propane professionals can provide homeowners with suggestions and ideas for creating a customized propane fireplace to meet their home heating needs. The idea of living green is everywhere in the home industry today, but there’s no single definition for the concept. Homeowners surveyed said “green” means many things in home energy use, including using energy from renewable resources (83 percent of responses), reducing carbon dioxide emissions (77 percent), and reducing total energy use or using appliances that both use and generate energy (69 percent). Homeowners also placed high priority on green home expertise. Eight of 10 respondents said that if building a new home or improving their current home, they would work with professionals who had expertise in green building or green appliances. Homeowners can learn more about efficient home heating with propane and can find a propane professional in their area by visiting www.usepropane.com. ¹Opinion Research Corporation’s Caravan Omnibus Survey, conducted Dec. 11–14, 2008.